Every year more and more fabulous Christmas markets pop up in Madrid where you can find unique presents, live music, and typical food. To get all the info on the different ones around town with schedules and locations check out our Complete Guide to Christmas Markets in Madrid. 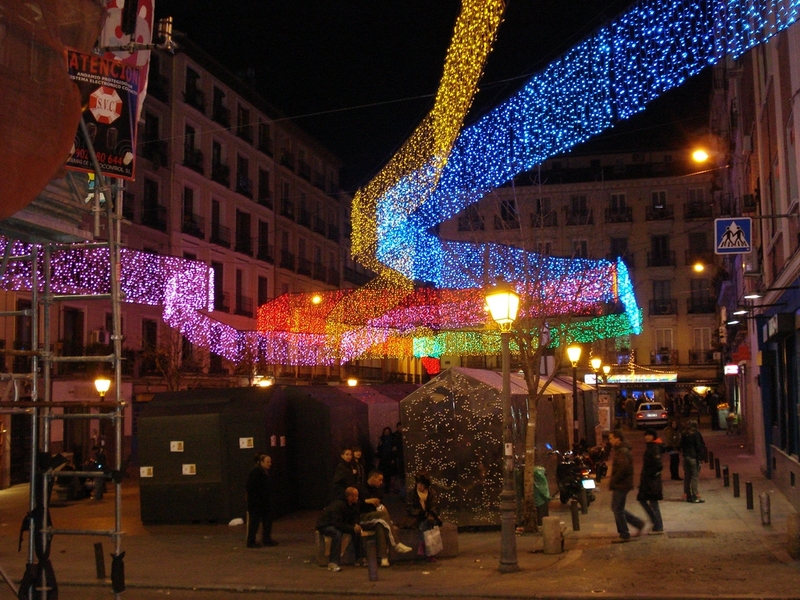 Downtown Madrid is peppered with Christmas lights that turn on at 6pm everyday. Depending on the day of the week, they stay on until midnight or later. There are also beautifully lit Christmas trees at Plaza Sol, Plaza Colón, Plaza Mayor, Gran Vía…. You can get to see most of these if you hop on the Navibus, Madrid’s Christmas light bus tour. The 45-minute tour starts on Calle Serrano at Plaza Colón and costs only 2€ per person. 2015 has been declared international year of light by UNESCO and this activity has been designed specifically to celebrate this. The treasure hunt is carried out at Madrid Río where the goal is to find all the light guardians who give each participant a light accessory to wear to reach the finish. To sign up, you pick up tickets at Casa del Reloj from 4pm to 6pm on December 26, 27, and 28 for 1€ per participant. Traffic on Paseo del Prado is going to be shut down on December 27th and January 3rd to let pedestrians and cyclists enjoy a series of activities and games. There will be a rock climbing wall, air hockey, lacrosse, disco golf, a giant dart board, bowling and much more from 10 am to 8 pm. The featured activity is Roller Disco with 5 Djs each day to get everyone boogieing on roller skates all day long. New this year to Madrid is the Christmas themed International Fair featuring embassies from 40 countries from all over the world. There are traditional dances from China, Palestine, and Israel, Christmas Carols from Guatemala, Ecuador, and Ukraine, and food from Argentina, Lebanon, and Ireland. The fair is at the Centro Cultural Conde Duque, December 17th to 22nd, 12:00 to 00:00. Get in the Christmas spirit iceskating at one of the temporary rinks at Plaza Colón, Plaza Luna or Plaza Callao. During the week, it is 5€ per hour and on the weekends, Christmas, and New Year’s Day it is 7,5€ per hour. REMEMBER! Gloves are required to skate, but if you don’t have any, you can buy them there for an extra 2€. The classic Dickens story, A Christmas Story, is playing in English at Teatro Infanta Isabel from December 12th to 27th with tickets starting at 12€. If music is your thing and you want to contribute to a good cause, there is a Christmas Concert to help raise funds for Fundación Più Mosso, an organization that focuses on investigating rare diseases. It’s on December 22nd at the Sala Sinfónica del Auditorio Nacional de Música de Madrid. Tickets are 10€. The famous and televised ‘cabalgata’ (wise men parade) is on January 5th on Paseo del Prado near Cibeles starting at 6pm and ending at 9pm with fireworks. If you find this parade too crowded, there are smaller ones in different neighborhoods around Madrid. Get the full details on the schedule and itineraries here. Take fun Spanish classes over the holidays with La Aventura Española to improve your Spanish and impress your friends when they get back from their holidays. The intensive and semi-intensive courses have cultural activities that will get you in the Christmas mood like ice skating and visiting Christmas markets while making new friends. To get more info send an email to helen@lets.education or call 912 196 99. For a full schedule of everything Christmas related going on in Madrid, check out the official website.